Dress up your window with bike parts plus bling! Assorted sizes available; please contact me for availability and pricing. A simple bracelet that uses disassembled bike chain components. Light and airy, closes with a lobster claw clasp. A tighter-fitting wrap bracelet made from shifter cables, chain face plates, and chain rollers. These lightweight earrings are made from two twisted chain face plates. Custom designs also available! These lightweight earrings are made from two twisted chain face plates. Each pair is just a little different! Custom designs also available! This necklace uses twisted chain face plates and a cassette sprocket for a truly unique look! Fastens with a lobster claw clasp. Each piece is just slightly different, so please contact me for what's available! For the twists and turns in your life and on your rides! This necklace uses twisted chain face plates and a shaped spoke. Fastens with a lobster claw clasp. Each piece is just slightly different, so please contact me for what's available! 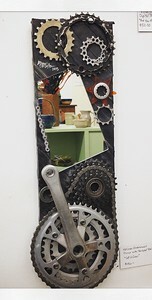 It's always time to ride with this bike themed wall clock! 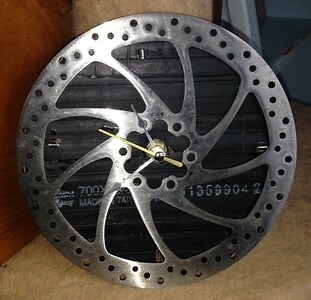 Made with an innertube backing and a brake disk, you'll never be late for a ride again! Having fun with inner tubes, gears, and chains! This conversation-starter will look great on your wall!